Superb! We ate here on 9th Feb, for the first time and were impressed with the service and friendliness of the staff. We had the aged entrecôte steak and chargrilled chicken both served on the table burner, both were cooked to perfection. Also we were able to change the sauce from what was stated on menu for free to whatever we wanted (peppercorn in our case) which was well received as sometimes restaurants don’t like to deviate from what is meant to be with the meal and sometimes not free of charge. Loved the table burner it is a brilliant touch. Unlimited fries, we definitely had plenty. Server came round three times while we were eating with more than a handful, after the second time we were already getting full. So it’s nice to see that the restaurant fulfils it’s promise of unlimited fries. We were there early enough on a Saturday night, we had reserved a table in advance and tables were filling up fast so would recommend to reserve just in case. An excellent evening with superb service –and not too noisy, which it has been in the past. The two of us both opted for your traditional entrecote steaks and although we ordered opposites – well-done and rare – they were both exactly right and served to the right person. We were tempted to eat here rather than elsewhere in St James, by your offer of a free bottle of wine. Knowing that your wines are supplied by BBR, we knew that all three would be good and we opted for the champagne. I appreciate that you need your mark-up on the wines as much as anything else, but compared with BBR’s shop prices just round the corner, some of those on your list are pushing things a little. Overall another very good evening. I have been eating at Rowley’s for over 20 years and the quality of your offer has been well-sustained. I look forward to the next 20 years Reviewed by an OpenTable diner on 31st August 2018. Reliable and excellent – I first ate at Rowleys as a student (a rare treat) probably 40+ years ago. The decor hasn’t changed nor the quality of the steaks! Don’t bother with the menu – its should steak all the way! My only grumble – previously the fries were limitless for all steaks, now just Chateaubriand. So pleased to return! Delicious food and wonderful service. – t’s been a good few months since we’ve been in London but we were thrilled to return. Rowley’s is so close to many of the famous sites and stores. We had been to the Royal Academy of Arts for an exhibition. Once we had finished, we walked the 3 minutes to Rowley’s. Monika, the manager, greeted us like old friends and we were soon sitting in the window, watching the world go by and selecting our food & drinks. My wife had the whitebait and I had the smoked salmon. Both were full of flavour… excuse me whilst I drool at the memory…. Loved it, perfect dinner before the theatre – We came here for my 21st birthday dinner before the theatre, the Chateaubriand steak was excellent, the service attentive and friendly and the claret was divine. Roll along to Rowley’s – What a great place to eat! We decided to dine at Rowley’s to celebrate two 65th birthdays. We had a great evening. The staff were very pleasant right from the start and did everything they could for us. The food was excellent. Three in the party ordered steaks and they were all cooked to perfection. The waiter was disappointed that we did not take up the offer of unlimited fries but the first plateful was extremely generous and the waist line has to be considered. Do try Rowley’s. You will not be disappointed. My wife and I ate here as part of our 30th anniversary celebration weekend. was my late father’s favourite dining place when work took him to London. And now it is ours. Fantastic meal and to top it off we discovered our favourite claret hidden on the wine list (you know the kind you get given and only serve on special occasions and to special friends). “Late supper” Was in here after 8.45 which is late for me. Went straight for their signature steak with sauce. When I heard that it was sirloin I asked for it to be cooked with the fat and then served lean. Had excellent bread and butter to start but steak came so promptly I could have skipped this as left most. Steak came as requested with tasty sauce and good pommes frites which were offered fresh half way though. Had a couple of scoops of excellent Union ice cream to finish. “Lovely meal” Visited with my wife last weekend for the second time, and was not disappointed. I had the entrecote steak and my wife had the t bone. Both were cooked to perfection (medium rare) and the side dish of cauliflower cheese was outstanding. I can’t understand the snobby attitude of some of here about the unlimited fries, if you don’t want them order mash or boiled potatoes?? A quick note to express my satisfaction with my three dining events at Rowley’s during my recent two weeks in London (25 Feb-12 Mar). I have been visiting Rowley’s since 1985 and the great draw is that nothing has changed, except the prices, of course. I always make a point of having dinner once per trip and I am never disappointed. A special thanks to Monica and Giada for taking care of my dining needs. “Excellent food and service” A few friends visited Rowley’s for lunch and were well looked after. We ordered Chateaubriand with Whitebait to start which was all excellent. They also serve unlimited chips if you can eat them. The wine we ordered was good too. This restaurant is not cheap but is very clean, the food is very good and the service we received from Monika was excellent. “Absolutely fantastic!” Went here for a family meal a few weeks ago and totally blown away by the quality of the steak! The chips are absolutely fantastic and staff are friendly and very welcoming. “Lovely restaurant & food.” Taken here for a treat. Very pleasant and welcoming staff. Who were very attentive despite using a voucher. Nice and cozy looking restaurant too. Arrived at 7pm and was quite quiet. But was almost fully booked a little over an hour later on leaving. Probably best to book in advance as I don’t think many wandered in of the street. “Excellent food in an Edwardian setting”-Walking along Jermyn Street in Mayfair after a long day of meetings, I came across this gem. Friendly and efficient staff, and a brief but familiar menu, made this a great place to eat solo on my way back to my hotel. The Catch of the Day was superb (Sea Bream), pan fried with olive oil and lemon. The broccoli was al dente, and sauté potatoes wonderful. Portion size was perfect. “Anniversary Dinner” –Whilst in London we visited Rowley’s on Saturday evening for Chateubriand. We both had a starter of capaccio beef and parfait duck pate. The ambiance of the restaurant was superb. When we asked for a window table, this was no problem. The main meal is designed for 2 and comes with unlimited fries. “ROWLEY’S HAS THE “WOW” FACTOR!! !”-My wife and I had lunch here yesterday before going to the theatre. We were greeted by Monica the Manager, who always has a lovely smile and loads of personality! She seated us and handed over the menus and wine list. She then passed us over to Lidia who very politely took our drinks order. I started with the fresh crab and prawn cocktail and my wife had the baby gem salad. I can report that the starters were first class! We washed these down with a glass of Pinot Grigio. For our main courses we had the Entrecote steak, me rare and my wife medium rare. Both were cooked to perfection with, of course, unlimited fries!!! For desert my wife had ice cream sorbet and I had the chocolate mousse which I have to say, was to die for!!!! As I said earlier, Monica is the manager here and under her the place runs so smoothly! She has such a lovely personality and I hope the owners, whoever they are, fully appreciate their diamond girl!!! “The food was great and the staff professional and superb” I could not fault the welcome, the attentive friendly service was very professional but was also not intrusive. We were two couples who meet up two or three times a year for lunch for a good old chinwag and hopefully a good meal. We managed to pick up a great deal for this restaurant, which turned out to be a great success. The deal was for a Chateaubriand for two people to share served with unlimited fries each and a side to share (choice of vegetables or salad) The food was delicious, beautifully cooked to our individual requirement and although we got a good deal we would have been happy to have it at full price of £70. As we dinned on a Monday 7th March 2016 we were also given a complimentary glass of wine each, but noticed they also have a good reasonably priced wine list for a centrally sited London restaurant. The sweet menu is a little limited but the two ladies enjoyed the sticky toffee pudding. We all enjoyed our experience at this good old fashioned Restaurant – Reviewed by Subnariner Woodford – 8th March 2016 – Trip Advisor. Zagat rated – A mix of “well-heeled” locals, “business associates” and “tourists” fill this “clubby” Piccadilly dining room exhibiting “old London flair” to match its “consistent”, “hearty” Traditional British menu that majors on “melt-in-the-mouth” steaks with “unlimited chips”, accompanied by “pleasant service”; some feel it’s “reasonably priced” while others deem it “expensive”, but most concede it’s “worth every penny”, especially for a special occasion like “a birthday treat”. “Local British Restaurant with 40 years of history and GREAT FOOD” – I have been to Rowley’s on many occasions is by far my favorite local British Restaurant. Whether for a business lunch, dinner or Sunday brunch, Rowley’s is always on top of their game. The restaurant is relatively small but does have a certain British atmosphere that is simple yet elegant. You will always be greeted with a warm smile and sat in comfortable setting with white elegant tablecloths. Be sure to make a reservation as this place is well know among the locals. 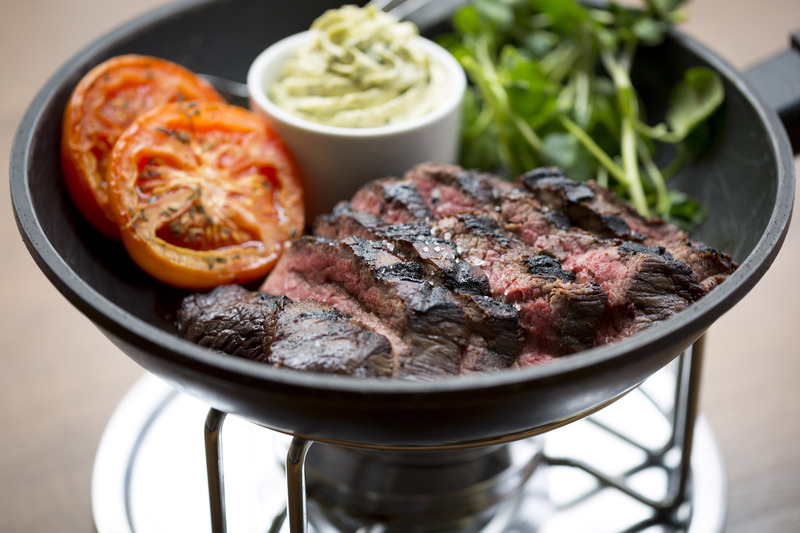 The specialty of the house is the 28 day Matured Entrecôte Steak which is served on a sizzling platter above a flaming urn to keep the meat hot at all times. Always exquisitely prepared and has a delicious flavor that fills the air. Bottom line is this is the best steak in London. I always eat this steak slowly with a nice glass of red wine and as such extinguish the flame as leaving it on continues the cooking process. The meat is tender, juicy and full of flavor, and to compliment this further , the restaurants serves a secret herb, Roquefort butter sauce. This is fabulous. Accompanying the steak is the UNLIMITED freshly cooked, deliciously hot, crisp and golden brown french fries. I always eat way too much of these fries. I have also tried the Herb Fed Organic Yorkshire Chicken. This meat is juicy and flavorful. Not sure of all the ingredients but the Yorkshire pudding batter they use is just awesome. Worth trying as this was a first for my taste buds. The Sunday brunch is always nice as I enjoy the roast beef and Yorkshire pudding. Served with season vegetables. Love the presentation and its always to have food that tastes as good as it looks. Served with warm rolls that are nice balance to roast beef and potatoes. Great with a nice French red wine. The wine list is okay. Some good French wines which I like, and a Spanish Rioja that is just perfect with red meat and very moderately priced. I have tried several of their desserts and the Sticky Toffee Pudding with fresh cream stands out as a local favorite. The texture is deliciously soft and flavorful with hints of toffee and vanilla. The service is outstanding although you will need to be patient as the wait time increases when they are running at or near capacity. “Lavish food and superb service” We were in town for a literature event and wanted a nice, intimate meal together before diving into the chaos of the convention atmosphere. So this was a special treat. We had already walked past once and the menu caught my husband’s eye, so we decided to go in. We got there right at noon and had the entire place to ourselves. The staff were warm and welcoming and seemed genuinely delighted to have us there. But the food! We had smoked partridge and venison tartare for starters, and both were exquisite. Delicately prepared and lavishly presented. For mains we both had the bouillabaisse, which was mouthwateringly delicious, followed by the apple doughnut and tonka bean panna cotta. The panna cotta had “popcorn foam”, an amazing touch. We had initially ordered cocktails, but there was a problem with the icemaker, so they weren’t able to accommodate us. So we just ordered wine instead. It wasn’t a problem for us at all, but they still decided not to charge us for the first two glasses. Superb service with a personal touch. “Mixed bag but they came out on top! !” My wife and I had booked for a leisurely lunch. We got a nice table although a little cosy once it filled up. Some accidents – tonic spilt – cleaned, replaced and made good quickly with apologies. Service was excellent and friendly – food delicious. Not cheap but you are in Jermyn St.
“Superb!”- Took a friend here for her birthday. I booked and asked for a window table (which we got) which was quite surprising considering it was a Saturday night. It’s a beautiful setting, an old butcher shop (It’s where Mr Walls begin selling his sausages) with large mirrors set into the tiled walls. Not too dark, not too bright. The staff were excellent. We were served by no less than three different people, all very pleasant and keen to make sure we had everything we wanted. The food was marvellous, the steaks cooked to perfection. “Wonderful First Class Experience” – Saturday 3/10/15 we had the Taster Menu with Wines and it was EXCELLENT! Great food and wine but also special personal service made it so much more than a meal out it was an evening of rounded entertainment. A very memorable occasion which I would recommend and I am very wary of recommending anything due to different personal preferences! “We have visited this restaurant some time ago and still keep reminding ourselves of the steak that we have ordered. It comes on a tray above a fire so it keeps it warm and nicely rested. The steak is coated in their own buttery sauce which is very delicious. To top that you can have as much fries as you want! Good selection of red wines and prompt service puts this restaurant in our personal top list. Restaurant being on a by street makes it less noisy yet in the very center of London. 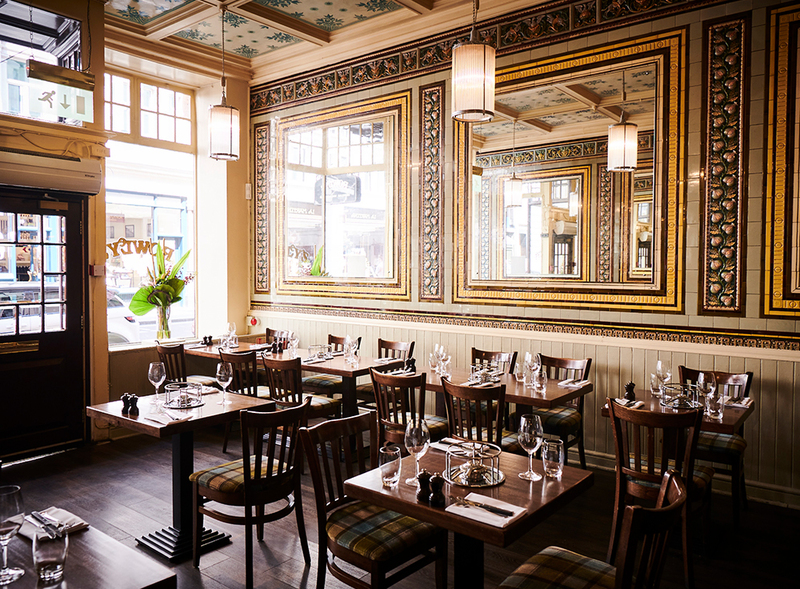 “I have the pleasure, for that is what it truly is, of regularly eating in Rowley’s around once a week and would say, with the full confidence of a regular, London ‘dine-outer’ that this really is the very finest steak eatery in the whole of London! Did you know we have a Rowley’s App? Download it to receive exclusive offers, invitations and a fantastic 10% off your bill! As ever excellent food, service and value! recommended to friends.